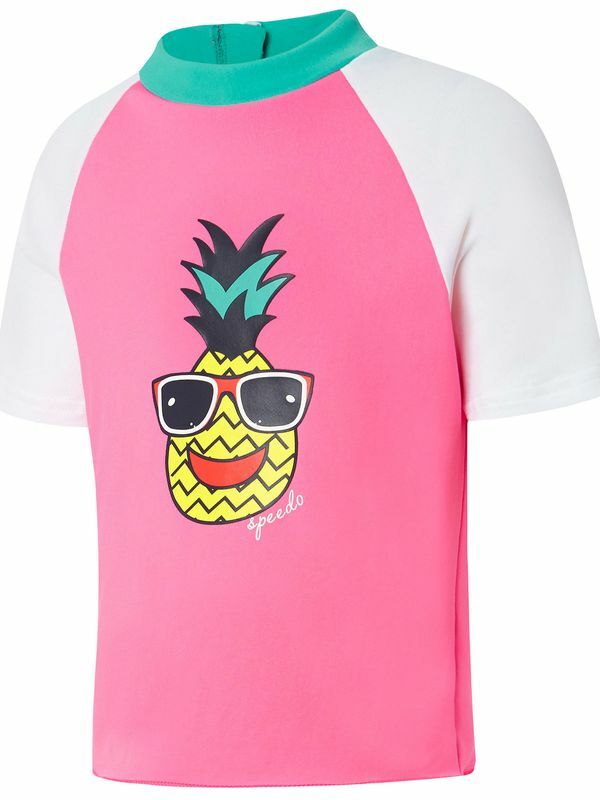 The Speedo Happy Days Toddler Girls Short Sleeve Sun Top is pink with white sleeves, a green collar and a multicoloured pineapple wearing sunglasses on the front. This sun top is short sleeved to provide protection from the sun’s rays. Your little girl will love wearing this comfortable sun top at the beach or at the pool. Happy Days Toddler Girls Sun Top manufactured by Speedo Swimwear the worlds leading swimwear brand. Speedo is passionate about life in and around the water, creating revolutionary new technologies, designs and innovations.